I’m sure you’ve all read in books that Venus is a planet that orbits the Sun and is closer to the Sun than is the Earth. But why learn from books what you can check for yourself?!? As many feared, Comet ISON didn’t survive its close visit to the Sun, so there’s no reason to get up at 6 in the morning to go looking for it. [You might want to look for dim but pretty Comet Lovejoy, however, barely visible to the naked eye from dark skies.] At 6 in the evening, however, there’s good reason to be looking in the western skies — the Moon (for the next few days) and Venus (for the next few weeks) are shining brightly there. Right now Venus is about as bright as it ever gets during its cycle. The very best way to look at them is with binoculars, or a small telescope. Easily with the telescope, and less easily with binoculars (you’ll need steady hands and sharp eyes, so be patient) you should be able to see that it’s not just the Moon that forms a crescent right now: Venus does too! If you watch Venus in your binoculars or telescope over the next few weeks, you’ll see proof, with your own eyes, that Venus, like the Earth, orbits the Sun, and it does so at a distance smaller than the distance from the Sun to Earth. and finally it would drop lower in the sky again at sunset, still rather bright, but now a thin crescent that was even larger from tip to tip than before. A planet (such as Mercury or Venus) with an orbit that is smaller than Earth’s has phases like the Moon. 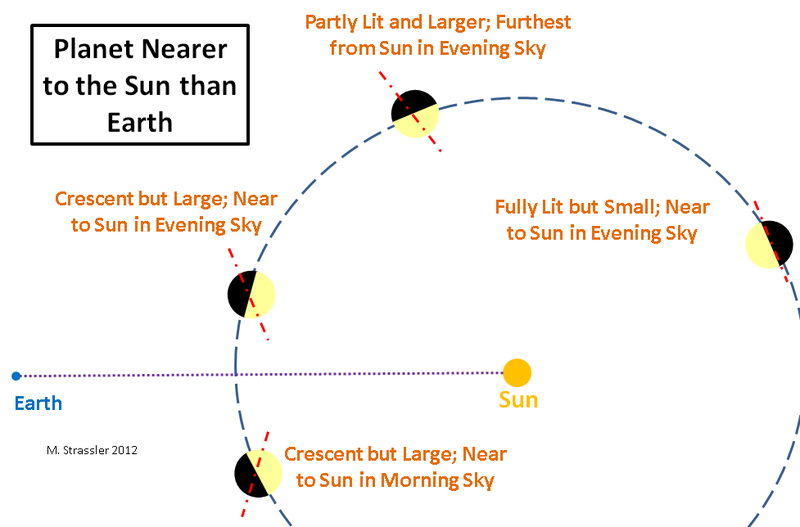 The portion of Venus that is lit is a half-sphere (shown in light color); the portion of Venus we can see is a different half-sphere (dashed red lines); the overlap is shaped like the wedge of an orange and looks like a crescent in the sky. But unlike the Moon, which is at a nearly fixed distance from Earth, such a planet appears to grow and shrink during its orbit round the Sun, due to its changing distance from Earth. It is always largest when a crescent and smallest when full, and is brightest somewhere in between. So go dig out those binoculars and telescopes, or use Venus as an excuse to buy new ones! Watch Venus, week by week, as it grows larger in the sky and becomes a thinner crescent, moving ever closer to the sunset horizon. And a month from now the Moon, having made its orbit round the Earth, will return as a new crescent for you to admire. Of course there’s another proof that Venus is closer to the Sun than Earth is: on very rare occasions Venus passes directly between the Earth and the Sun. 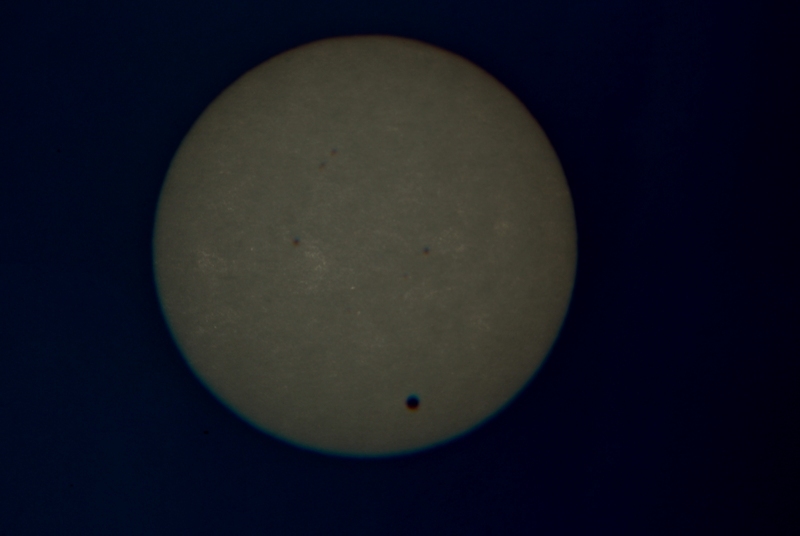 No more of those “transits” for a long time I’m afraid, but you can see pictures of last June’s transit here, and read about the great scientific value of such transits here. First, I’m participating in a panel discussion today (Thursday June 7th) on the transition that has seen me add science writer and popularizer to my resume’. Here’s the link… free tickets required, click here for details and tickets. Sponsored by SoNYC (Science online New York City), panel discussion entitled “Reaching out of the Ivory Tower”, about the experiences of scientists who are reaching out to the public. Panelists: Ethan Perlstein, Sarah Weisberg, Matt Strassler, Jeanne Garbarino. Location and time: Weiss 305, Rockefeller University, East 66th and York Ave. New York, NY, 7:00 PM. Presenting science to the public in a digestible but honest form is something I feel is important, and I’ll have a few words to say about why I chose to do it now and why via a website and blog. And then I guess the floor will be open to questions, so come on by and ask one! Reminder: again in New York, Saturday June 16th at 2pm, I’ll be giving a lecture (click here for details): THE EINSTEIN OBSESSION: SCIENCE, MYTH AND PUBLIC PERCEPTION. Here’s one of my own best shots, which I show you not because you can’t find better shots on the internet but because I have learned that most people do not realize you can get such nice views of the sun with so little work. Venus in transit, at bottom. Several sunspots dot the central region of the sun’s disk. Photo of projection through binoculars onto white screen. Image has been darkened slightly to sharpen contrast between sun and background. Photo: M. Strassler 2012, all rights reserved. It’s really quite easy. And though there won’t be any more transits of Venus for us to see, there will be bigger sunspots, transits of Mercury, and solar eclipses to watch over the coming 15 years, so you may as well learn how to do this. You just aim the binoculars, big side toward the sun (as though someone were going to look at the sun — BUT DON’T LET ANYONE LOOK, of course), in the rough direction of the sun, wiggle the binoculars until the shadow of the binoculars becomes as small as it possibly can (which tells you they are aligned with the sun) and at that point the sun will shine through the two sides of the binoculars, giving you two images. Put a lens cover on one of the sides if you want to just get one image. Then let the image project onto something white and smooth that can serve as a screen. By moving the screen forward or back you can get a larger or smaller image; by using the focus on the binoculars you can bring the image of the sun into focus. Works great! Here’s a picture, taken in a similar way, from the annular eclipse last month — a transit of the moon, even though we don’t usually call it that — taken the same way. I like this shot (though focus is imperfect and it was taken from a funny angle) because where the moon’s shadow touches the sun’s limb you can see a bit of light shining between mountain ranges on the moon! 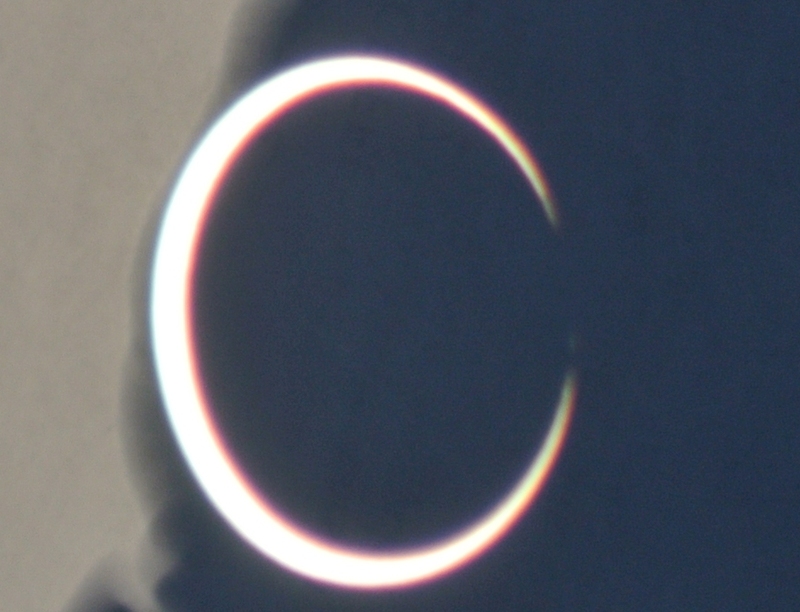 A few seconds before annularity begins during the annular eclipse of the sun on May 20, 2012. Note, in the region where the moon’s silhouette touches the sun’s limb, a patch of sunlight shining through the mountain ranges on the moon. Light and dark regions at left and right of photo are due to shadows on the projection screen. Photo: M. Strassler 2012, all rights reserved. Venus, passing between the Sun and the Earth on Tuesday, has now transitioned from an object in the evening sky to one in the morning sky; if you want to see it, large and a very thin crescent through binoculars, you’ll need to get up early, before sunrise. Not yet, though; it will be a few days before Venus is far enough from the Sun to pick out in the dawn sky. For now, you can see Venus via the SOHO satellite, which blots out the sun so what’s nearby can be observed. A final transition: Ray Bradbury died. Bradbury was one of the 20th century’s great science fiction writers, and I especially enjoyed reading his stories because he didn’t write classic geeky science fiction. His work was much more thoughtful and human than that. I think one could make a case that what made his writing unique was that he didn’t separate science from the rest of life. It’s a good example for the rest of us to follow.